Heroes: Version 3.1 Update Now Available! The first major post-3.0 update is now available in Fire Emblem Heroes! Load up the game to begin downloading the Version 3.1 Update for access to the newest changes. If Heroes does not download the update automatically, you can grab it manually from the Play Store or App Store. Most notably, Version 3.1 provides support for a new type of hero: Beast Heroes, which will be arriving tomorrow in the Rulers of the Laguz banner. We also get updates to Legendary and Mythic Effects and some AR changes. Additionally, four heroes can make use of new Weapon Refinery Updates. Read more below for further details and other small changes. Heroes: Version 3.1.0 Incoming, Update to Merge Allies, Legendary Azura + More! Fire Emblem Heroes has shared news of the next version update, which is scheduled for early January 2019. You can find the information via the in-game notifications, but for your convenience, we’ll go over them here. Firstly, as teased in the latest FEH Channel, Heroes with beast weapons will finally be arriving. No new information was shared, so we still only know of Tibarn and Nailah. But existing skills have been updated to account for these new weapons. Next, Legendary Effects and Mythic Effects will play a slightly bigger role. In Aether Raids, Legendary Heroes will receive Mythic Effects if a Mythic Hero is present and both of their elements are aligned with the current season. Likewise, Mythic Heroes will receive Legendary Effects if a Legendary Hero is present and both of their elements are aligned with the current season. This applies for all battles outside of Aether Raids, except Blessed Gardens. For example, the current season is Water, Wind, Light and Dark. So if you have Legendary Fjorm (Water) and Mythic Eir (Light) in the same team, Fjorm will get a stat and Lift boost in Aether Raids, while Eir will get a stat boost in Arena etc. 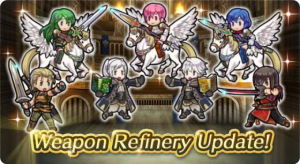 Heroes: New Weapon Refinery Updates for December Update! Ever since Heroes claimed that the Version 3.0 Update would come in December, players have eagerly been awaiting news. Now we might have the first piece of it, with New Weapon Refinery Updates planned to go into effect soon! 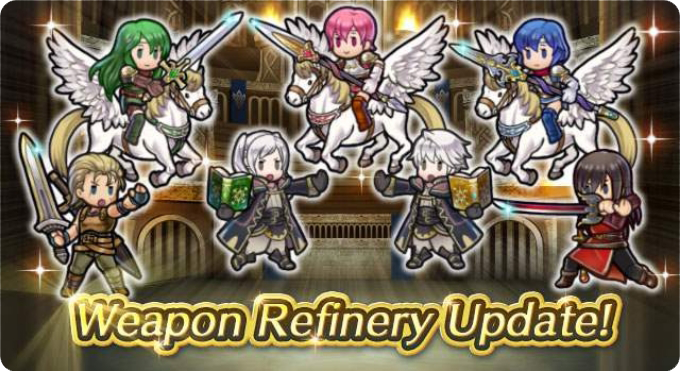 Additionally, all of these weapons will get further upgrades via the Weapon Refinery! The Japanese Heroes twitter claims that the Whitewings’ weapons will have a special Triangle Attack effect. What do you think the other weapons’ special abilities will be? Unfortunately we don’t have any further news as to when the update will come, aside from “December”. We also don’t know what else will be planned to come along with it, besides the hints towards Book III. Hopefully we’ll get some more information soon. 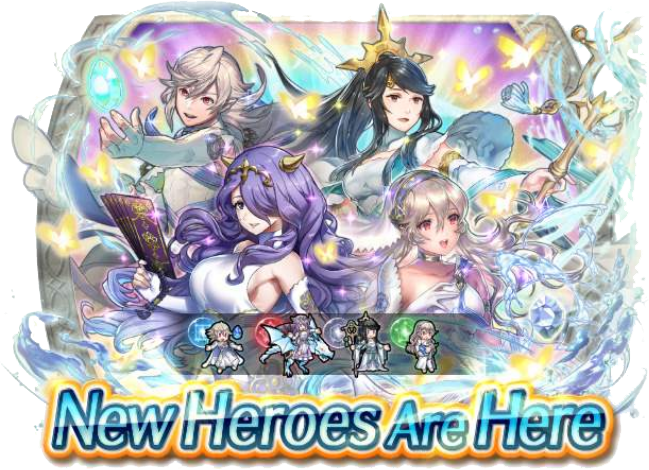 Heroes: Adrift Banner, 2.11 Update, & Aether Raids Now Available! The latest Summoning Focus has arrived in Fire Emblem Heroes! The latest Adrift Banner is now available for all summoners. 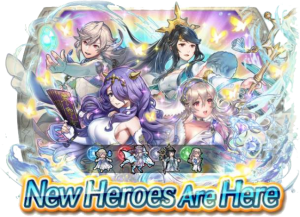 Spend some Orbs to summon up new alternate versions of M!Corrin, F!Corrin, and Camilla, as well as the brand new Mikoto. Check out our earlier article for a better look at these heroes. In addition to the banner, all four of these heroes also appear in the new Paralogue, also called Adrift. Beat all three paralogue chapters on all difficulties and complete the matching quests to earn up to 12 Orbs! We also get another Log-In Bonus to earn Orbs daily just for logging in over the next 10 days. If you’d like even more Orbs to summon these new heroes, the November Orb Promo also begins today! For the usual price, you can buy 21 Orbs along with a special gift of 60 Sacred Coins. It’ll last the a whole month until the December promo comes out. The Adrift Banner will last until 21 November. Presumably, we’ll get a new batch of heroes then, possibly along with Book III? This banner also officially concludes our most recent Event Calendar, so hopefully we’ll get another one of those soon. Furthermore, the Version 2.11 Update is now available! You can update within Google Play or the App Store if your Heroes app doesn’t load the update automatically. This update contains the new Aether Raids gameplay mode information, which also begins today! We also get access to the Heroic Grails feature. Check out our Feh Channel article for more information, or jump into the game and play through the tutorial yourself. Read on below for further details of the update changes.